The holidays are upon us! We can feel the celebratory mood in the air around us. It is a time for us lucky ones to reconnect with our families and the people we love. I say “us lucky ones” because I know that some of you who are reading this will probably be working, or don’t have the means to be with their loved ones during the holiday season. To all of you I send my warmest and most positive thoughts. I have been there myself and I know the feeling. It is temporary. Next year things will get better. To everybody else that will be celebrating these days with their friends and family I wish all the best. Enjoy your time with them, cherish it and make memories with your cameras! The holiday season is a great time to hit the streets and make photos but it is also one of the few times we get to see and to make photos of people we haven’t seen in ages. Keep a camera around your neck at all times and make the most of these relaxing days by letting your creative side surface. Just make photos of anything that stimulates you, that inspires you. Don’t care about “keepers” and don’t worry about what others will say about your photos. Let yourself go, snap anything and anyone and enjoy this holiday season as much as you can, whether you are alone or not. 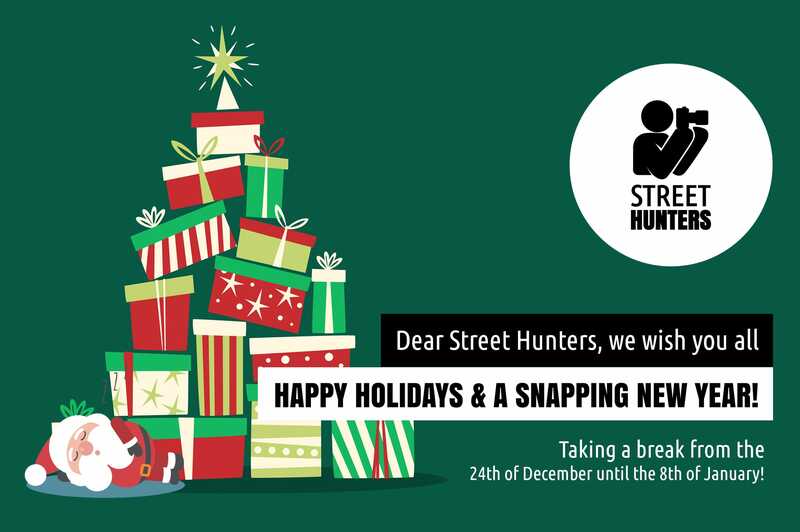 As for Streethunters.net, well it has been another busy year for us. We got to record many videos for our YouTube channel, we launched the new Street Talk series and the Street Photographer Slideshow Presentations, we published a few Street Hunt videos, we interviewed many street photographers, reviewed photography books, we held workshops in Athens and London, we got featured in amazing online and print magazines, we got to meet you in the flesh at the 3rd Annual Street Hunters meeting that took place as always in London, we had the honour of presenting at the London Street Photography Festival and helped organised the first Street Photography Festival in Athens, the PhoS Street Photography Festival. Streethunters.net presence at the festival wasn’t only organisational but we also taught workshops and enjoyed shooting for 3 days in a row. Now, just before the end of the year, we are closing by organising one more workshops. The Christmas Beginners Street Photography workshop, which will be held in the colourful and busy capital of Greece, my beloved Athens. Keep in mind that there are still open positions in the workshop if you want to join at the last minute. And now it is break time! After all that action packed year, we feel that it is time for us to take a nice break to relax. We think that 2 full weeks are perfect for us to recharge our batteries and get prepared for the new exciting challenges that we will be facing in 2018. We look forward to organising the 4th Annual Street Hunters meeting, recording Street Hunt videos, possibly in various European countries, meeting new street photographers and focusing our energy on the Street Photography Community which we love and believe in so much. See you again in 2 weeks. Happy Holidays!